Arrival at Delhi Airport/ Railway station. Pick up by our driver and transfers to your hotel. After some rest, procees for Old Delhi city tour, covering Raj Ghat and Shanti Vana – the cremation sites of Mahatma Gandhi and Jawaharlal Nehru, Jama Masjid and drive past Red Fort and Chandni Chowk. Rest of the day free for leisure. Drop at hotel by 9pm. Overnight stay at hotel. After breakfast, check out from hotel and proceed to visit Qutub Minar, Humayun’s Tomb, India Gate (War Memorial Arch ), Lakshminarayan Temple – a modern Hindu Temple. Drive past President’s House, Parliament House, Government Secretariat Buildings and Connaught Place shopping centre. Overnight stay at hotel. 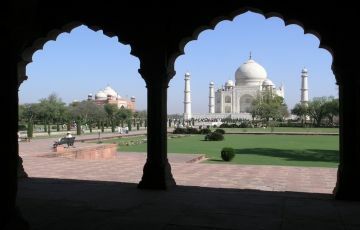 After breakfast, proceed to visit Agra. 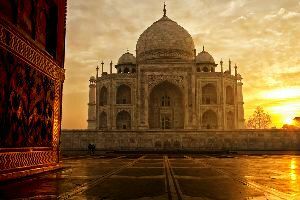 On arrival at Agra, check in to your hotel and after some rest, visit the world famous Taj Mahal built by the Mughul Emperor Shahjehan in the memory of his beloved wife Queen Mumtaz. After lunch (on your own), you will visit the Agra Fort and the Tomb of Itmad-ud-Daullah built by Empress Noorjehan in memory of her father. Evening at your leisure, you might plan to witness the Light & Sound show at Agra Fort. Show timings: Hindi- 19:30 to 20:23 PM; English-20:30 to 21:23 PM. Over Night Stay In Agra. Early morning after breakfast checkout from the Hotel and then drive Jaipur via Fatehpur Sikri- a perfectly preserved red sandstone “ghost town” which was the estranged capital of mughal emperor Akbar and deserted when its water supply failed. After reaching Jaipur, check into hotel. And in the evening, proceed to visit Chaukhi Dhani, pretty famous for traditional folk dances and Rajasthani food. Overnight stay at hotel. 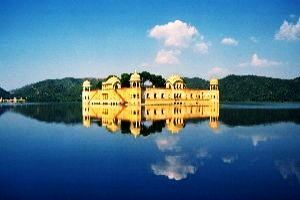 Today we drive to the semi-desert Shekhawati region, which lies in a triangular area between Delhi, Jaipur and Bikaner. The small towns in this region were once important trading posts, and today their legacy is carried on through the beautiful painted havelis that were constructed by wealthy merchants here in the 18th and 19th centuries. Later enjoy a walk through a local village and relax. Overnight stay at Alsisar. After breakfast, proceed to Delhi. Reach Delhi and evening free to roam around. Chose to opt for shopping and dine at the heart of the city tonight. Overnight stay at Hotel. After breakfast, checkout from hotel and transfers to airport for your onward flight to Goa. (Price included). On Arrival at Goa, SIC transfers to your hotel. Check into hotel and overnight stay. Next 5 days at Goa, to explore the city, rent out a bike or scooty, visit Churches at Old Goa, try scuba and other water sports at Calangute, try hands on at Casinos at Royal Casino at Panjim, enroll for cooking sessions and spend days like never before. After breakfast, drop at Airport for your onward flight to Delhi (cost included) with memories.